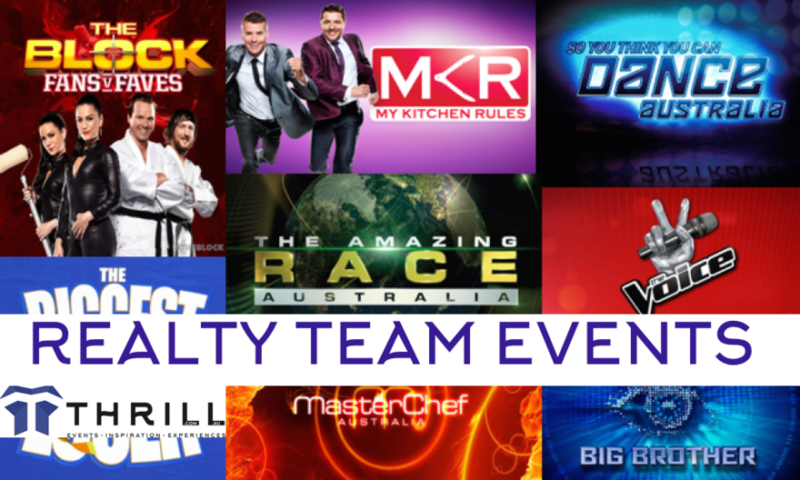 THRILL designs and delivers exceptional Reality TV styled group events in Sydney, Hunter Valley, Southern Highlands, Central Coast, Blue Mountains, Gold Coast and Brisbane. Play for hand crafted Survivor immunity idols, Amazing Race Trophies, Locked in Treasure Chest Holy Grails and Master Chef Plates. Or seek strategic alignment for business team development with Mission Possible. Trained Professionals adapt there knowledge to facilitate your team. Strengthening teams relationships and bonds. Ideal for corporate group experiences and workplace celebrations for corporate teams. Themed along the style of CBS SURVIVOR TV series. With excellent team challenge activities. There is no eliminations or voting off. Reward corporate teams with fun outdoor events and Survivor activities, Australia wide. Creating strategic team learning experiences. Utilising carefully designed and delivered team building strategies. We develop your employees leadership skills in a series of facilitated activities. Succeeding in accomplishing professional immunity challenges. Encourage your colleagues to live there reality TV dreams if a Fun team oriented scenario. Impress Manu, Dazzle Delta or Outplay the Chaser in Thrills reality team events. You select the goals and purpose of your event, fully customisable to your needs. Team Building Games in Sydney to Melbourne are customised for all corporate groups at all conference venues. Thrill team events professionally handles from 15 up to 1,000 participants. Ideal to motivate and challenge teams to be resourceful, think on their feet, problem solve and establish team bonds. We specialises in large group events and activities Australia wide. Suitable for all abilities with a ‘Challenge-by-Choice’ philosophy. Regardless of ability, fitness or strength. We unify teams to accomplish their goals. Teams known as Tribes compete in immunity challenges and activities together. Perfect for siloed teams and sales force to develop their teamwork. Presented are 4-5 Challenges in 1/2 day events or 6-10 Activities on Full day events. Navigation and Orienteering using map and compass. Determining a strategic direction. Tribal Council Finale with voting. From interactive incentive rewards to serious team building exercises. We design replica challenges with hosts supplied. The events are tailored to each business, corporate groups values. Ideal with morning or afternoon tea and BBQ lunch catering options. From half day 2-3hrs to Multi-Day Packages with a selection of accommodation styles available. Evening themed night events organised. Terrific for End Of Financial Year and Christmas Celebration team events. Survivor team building events are rewarding experiences in Sydney in Centennial, Bicentennial or Sydney Olympic Park. At Pyrmont, Ultimo and on Sydney or Central Coast Beaches. Blended survival with wine in style in the Hunter Valley. Outstanding events at Cypress Lakes, Peppers Convent, Sebel Kirkton Park. Or direct at Hunter Valley Crowne Plaza, Hunter Valley Resort, Tuscany Resort and Potters Brewhouse. Unique to the Southern Highlands Bowral, Cragieburn and Gibralatar Hotels, along with Milton Park and Peppers Manor House. Victoria on the Great Ocean Road, Melbourne. Available all conference venues and centres, Resorts, Peppers, Crowne Plazas, Mercure, Novotels. From the Blue Mountains Fairmont Resort to Lilianfels, Echoes, Bushland, National Parks. Out on Sydney Harbour to Cockatoo Island and Shark Island. MEP management wanted a team building event. Survivor is what they had chosen and the Thrill event team was fantastic! The staff did a great job in organising the event, everything ran smoothly. “Everyone had a great time, laughed, ate and drank and the program was a lot of fun. The photos are also great, thanks for those amazing shots”. The best teamwork development day I have ever experienced. The facilitation was excellent and the execution of the highest professional standard. I believe this will mark the future success of Biotronik Australia”. INTERCALL Survival Team Games: “Intercall’s Survivor program was a fantastic success; all participants experienced significant growth. Team cohesiveness improved on all counts, a challenging yet great fun time was had by all”. DIVA completed the Manly Beach Survivor team building program together designed to strengthen their national team. “The girls had a great time, lots of fun and a great willingness to complete all challenges that were set before them! A terrific accomplishment” Survivor Jeff Probst fill in Host, Konrad Lippmann. We headed south for events in the Southern Highlands. A stunning day in Bundanoon where Watershed teams united to accomplish all we could muster. Beneficial teamwork program that unites teams. Providing fun physical corporate employee mental health well being activities. Corporate challenges outdoors that everyone in your team can accomplish. Have fun participating in survival style team building and learn from the experience. Recently our client NAB raised funds for Camp Quality with a Survival fun program off site in Centennial Park. In excess of 1,000 organisations and corporations have benefited from Thrill Reality TV styled Survivor Events in Australia. MEP, RGA, Subaru, DIVA, Google, Inchcape, Biotronik, PwC, Maxxium, Land Water Australia, Jones Lang LaSalle, HP, Nestle, Intercall, Nokia, CBA, Xpedite, Citigroup, AGFA, Fosters, ING, Network Appliance, ANZ, CA, AMEX, Macquarie Bank, FMK & Arnott’s, Watershed.